The aspect of B:I that intrigues me most, as both a Christian and a student of literature, is its story. While most game developers seem content to relegate storytelling to a secondary position behind flashy new gameplay mechanics, Irrational’s Ken Levine tells a masterful tale that takes center stage in Infinite. The premise seems simple enough, at first: The year is 1912. 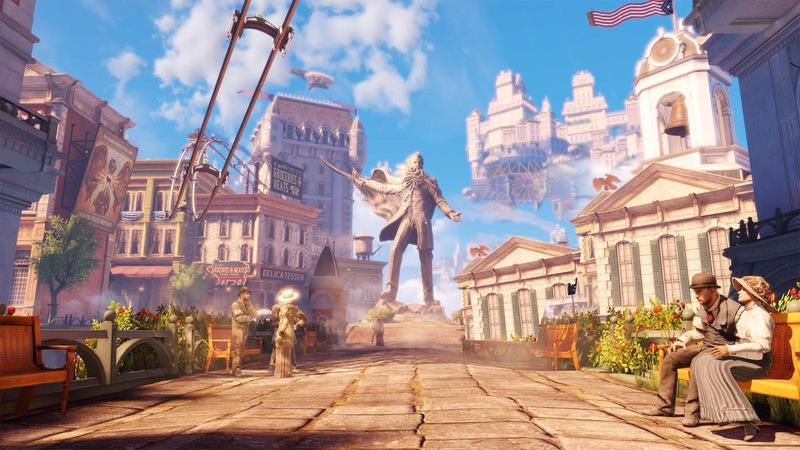 The player inhabits the skin of Booker DeWitt, a former Pinkerton agent who is hired to rescue a girl named Elizabeth from Columbia, a magnificent floating city in the clouds ruled by the zealous prophet/dictator Nathan Hale Comstock. Success seems like a long shot, but Booker has debts to pay, and this is his last chance at paying them. When he arrives in Columbia, then, his path seems clear. It is only after he frees Elizabeth from her tower-prison that things start falling apart…in some cases, literally. Preacher Witting: Come on, now, time’s a-wasting. Elizabeth [to Booker]: Why were you here? Preacher Witting: Are you ready to have your past erased? Are you ready to have your sins cleansed? Are you ready to be born again? Take my hand. Booker: No. No, I don’t want to. Elizabeth: But you already did, didn’t you? Preacher Witting: Are you ready to be born again? Preacher Witting: Do you hate your sins? Preacher Witting: Do you hate your wickedness? Booker [through clenched teeth]: Yes. Preacher Witting: Do you want to clean the slate, leave behind all you were before, and be born again in the blood of the Lamb? This scene is the center of the story, the turning point, the seed from which B:I‘s multiple timelines spring. 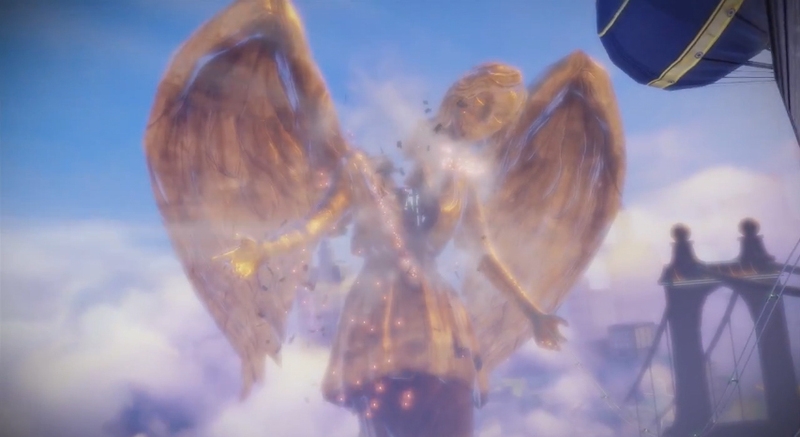 In one timeline, Booker accepts his baptism, becoming the Comstock who goes on to found Columbia, imprison Elizabeth, and become the game’s antagonist. In another timeline, he refuses, has a daughter, and turns to a life of drinking and gambling that eventually forces him to give up his child as payment for his debts. Some reviewers have suggested that B:I’s violence trumps whatever lessons it has to share. I disagree; in fact, I think one can make the case that all of Booker’s violent acts throughout the game are the result of a profound spiritual dissonance within him. There’s a telling moment in this final scene, after Booker refuses the baptism, when Elizabeth turns to him and notes somewhat quizzically, “You didn’t go through with it.” Booker responds, “You think a dunk in the river’s gonna change the things I’ve done? Let’s get out of here.” This line seems to sum up the problem at the heart of B:I—namely, the feeling of unforgivability. Unlike Preacher Witting or his fellow converts at the baptism, Booker constantly inhabits the reality of his sins. He feels their weight, and that weight is crushing, so much so that he comes to believe himself to be beyond redemption. Booker is repentant, no question about it; he wants to leave his sins behind him. But his inability to accept forgiveness is what fractures his story, what causes him to become either a gambling drunk who abandons his daughter or a zealous monomaniac who terrorizes his people. In one of the voxophone recordings found early in the game, Comstock holds forth on the nature of baptism, musing, “One man goes into the waters of baptism. A different man comes out, born again. But who is that man who lies submerged? Perhaps the swimmer is both sinner and saint, until he is revealed unto the eyes of man.” Many Christians may share Comstock’s confusion. While God thinks of us as new creations, more often than not we struggle to “put off the old man” and assume our new natures. Our sins haunt us, as they haunt DeWitt, and we find ourselves struggling to understanding how God’s grace can really be as good as it claims. At such times, it’s easy to make recourse to tired platitudes and cliches about forgiveness or to sink into despair rather than asking ourselves whether or not we’re truly receptive to God’s love for the unloveable. What’s even worse, though, is that Preacher Witting, in his eagerness to earn converts for his faith, takes no time to learn Booker’s story or to help him process through the loads of emotional and spiritual baggage that he carries inside of him. His faith is in the act of baptism itself, not the God of the baptism who seeks to restore hearts rather than rap sheets. At the point of his baptism, Booker is a broken man, incapable of making the fine distinction between contrition and despair. Witting should have been his shepherd; instead, he turns Booker into a wolf. Cheap grace is not the kind of forgiveness of sin which frees us from the toils of sin. Cheap grace is the grace we bestow on ourselves. Cheap grace is the preaching of forgiveness without requiring repentance, baptism without church discipline, communion without confession, absolution without personal confession. Cheap grace is grace without discipleship, grace without the cross, grace without Jesus Christ, living and incarnate. By only offering Booker the “cheap grace” of a shotgun baptism without the heart of repentance, Witting ultimately robs him of the opportunity to experience a baptism that is truly cleansing, that stands as the first step in a long road of faithful discipleship. Instead, as Comstock himself says, Booker’s road “always ends in blood.” This makes B:I not only one of the most compelling games I’ve ever played, but also one of the most deeply tragic. Though I disagree with the religious about most of their beliefs, including the ‘cleansing’ power of ritualistic bathing, this was a very good article. Sagrav, maybe I can elaborate a bit more on what baptism symbolizes and does. The first thing you should know is that Christians don’t believe it’s the physical act of washing in water that actually removes our sin. Rather, it’s a sign that we have chosen to become Christians and are making this declaration public (hence the practice of baptizing in front of a crowd). Baptism also has symbolic significance because of the imagery of lying down in the water (death) and being drawn back up again (resurrection). This is the reason why some of us believe infants should not be baptized. If they can’t make a declaration of faith, then there’s no point in sprinkling a little water on them. Excellent article, Adam. You hit right at some of the key things that I hated about the game’s story. Though, I think that Levine’s misappropriation of the nature of baptism was a bit more at the root of all of the plot’s hinges. Most problematic for me is that the existence of anti-gravity science, time-travel, and Booker becoming a racist cult leader all somehow seem to hinge on Booker getting baptized. It’s such an odd thing to hinge a plot on. Thanks again for writing about it.